Hecate, Dark Goddess of the Underworld. "Be comforted. I am here to guide you through the dark." 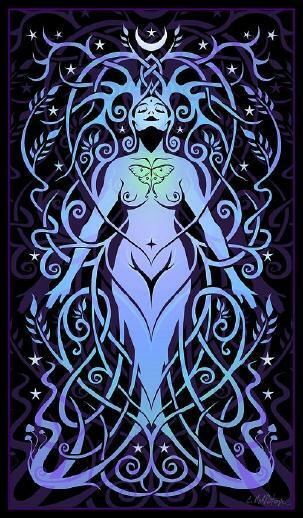 November 16th is traditionally "Hecate’s Night," which is a Neopagan/Wiccan celebration the onset of the Dark Half of the year with this dark goddess—the "Queen of the Night." (It should be pointd out that this date is a purely modern invention. There's no modern equivalent to the timing of Hecate's celebration in the ancient world [16th August/September], due to the diffirernce between the old lunisolar and our solar calendars. 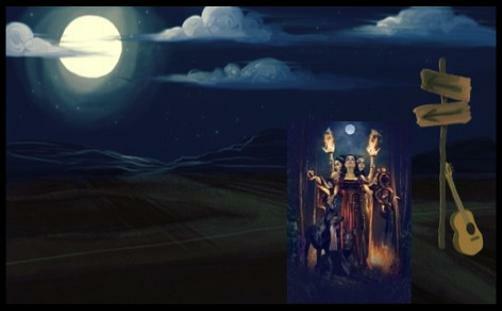 However, the ancients were known to also observe a Hecate festival on the dark/new moon or at the end of each month.) Hecate appears in poetry as early as Hesiod’s Theogony, where she is promoted strongly as a Great Goddess. She was among the offspring of Gaia and Uranus, the Earth and Sky, and great powers were ascribed to her. 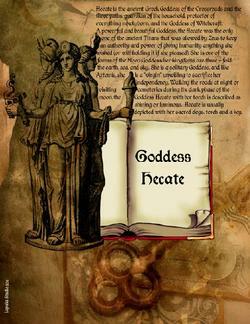 Hecate also holds the honors (like Persephone) in the three realms—heaven, earth, and underworld. 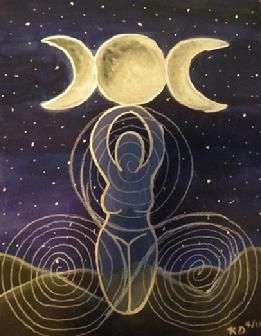 Thus, Hecate is a triple goddess. 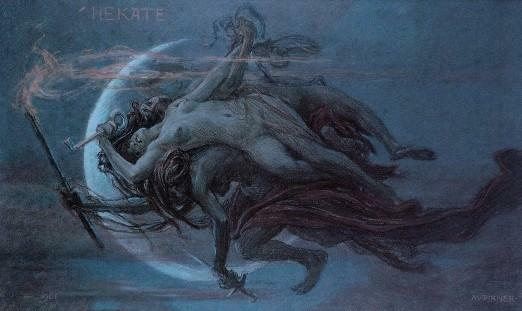 In the Homeric Hymn To Demeter, the moon-goddess Hecate is the only one to hear Persephone’s cries during her abduction. 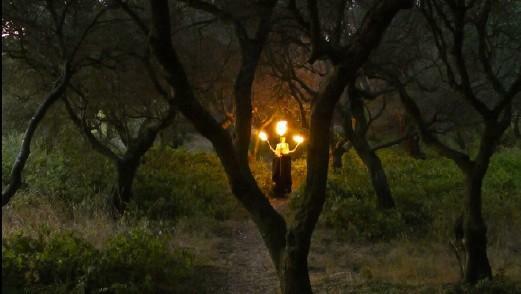 In searching for Persephone, Demeter is joined by Hecate. 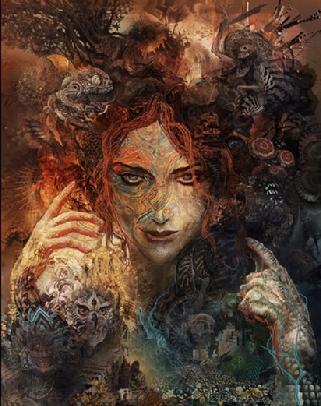 When Persephone returns from the Underworld, Hecate vows to serve her as her chief attendant. 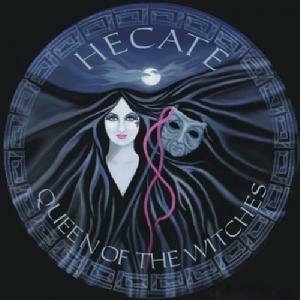 In later myth and cult, Hecate is strongly associated with both goddesses, becoming at times virtually identical with Persephone, "Queen of the Underworld." Thus Hecate is ideally suited to play the mediating role she adopts in the Hymn between mother and daughter, where she both identifies herself with the mother and promises to serve as an underworld attendant to Queen Persephone. In some versions of the myth, Hecate is said to be Demeter’s daughter or to have gone into the underworld to search for Persephone; in others, she was even identified with Persephone. Her links with the moon and the world below associate her with Persephone, for the moon rises and sets just as Persephone (who later became a moon goddess herself) descends and ascends. 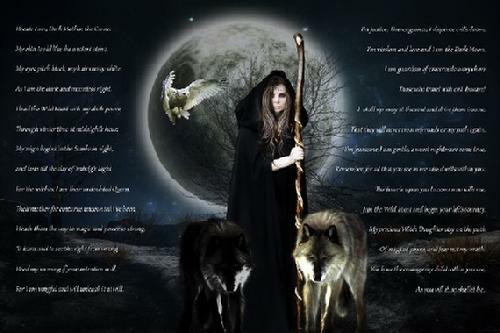 The Goddess Hecate is the wandering "Mistress of the Night" and represents the waning to dark cycle of the Moon, and most particularly the three days of the dark moon and new moon. Hecate symbolizes the dark within us, the part of our psyche we refuse to acknowledge. 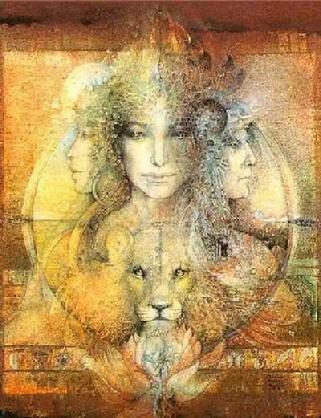 Many ignore the wisdom, the strength and the truth of Hecate, because our fear of the darkness is so strong. 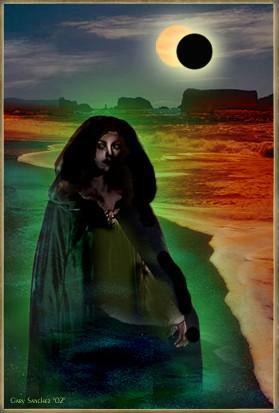 Hecate is associated with the dark side of the moon; in psychological terms, "the wisdom of the unconscious." 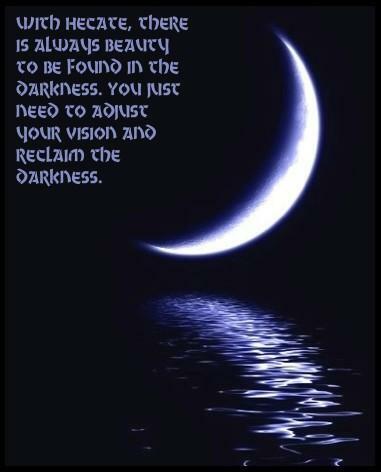 Through Hecate, one can reclaim the "beautiful darkness" that has been exiled from our overly solar consciousness. 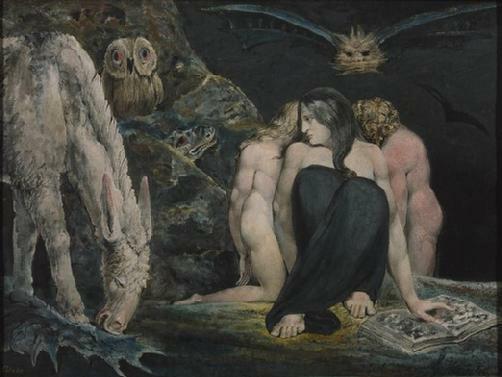 Hecate I am, Dark Mother, the Crone. My eyes pitch black, my hair snowy white. Through winter time at midnight’s hour. 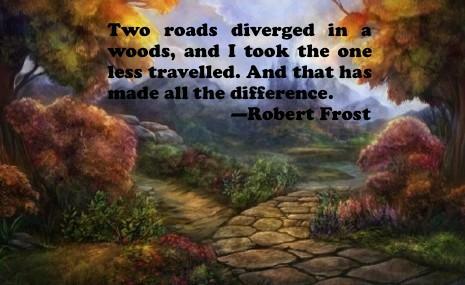 And lasts till the day of Imbolc’s Light. Their mother for centuries uncounted I've been. To learn and to see the right from wrong. For I am vengeful and will unleash it at will. 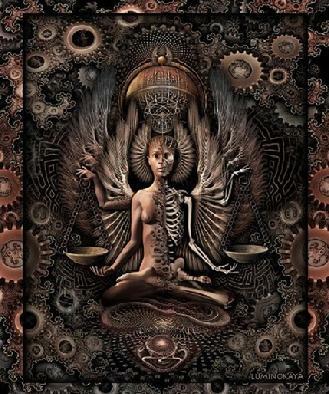 I am wisdom and love and I am the Dark Moon. Those who travel with evil beware! That they will never cross my roads or my path again. Remember, for all that you see in me also dwells within you. Join the Wild Hunt and begin your life’s journey. Of magical power, and fear not my wrath. 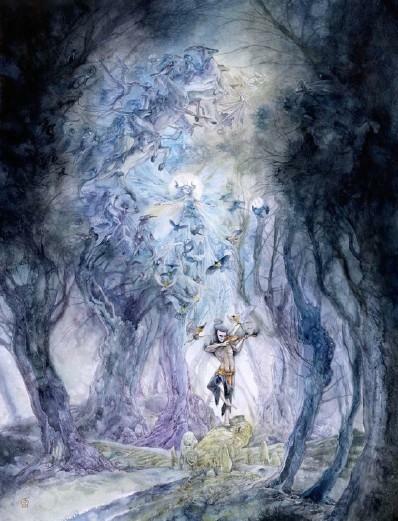 For more information about "The Wild Hunt" in Celtic and European folklore and its phenomenon during the Samhain festival in Celtic countries, click here. 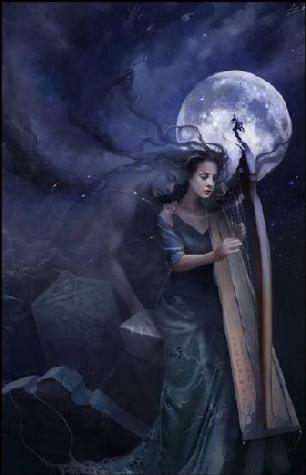 For the more of the spirits of Samhain-Hecate season, go to page # 7, The School of the Night. 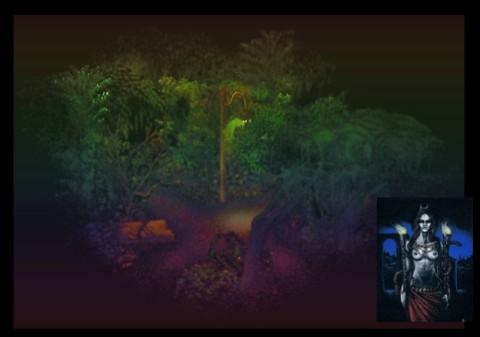 See, specifically, the section "The School of the Night & the Night-Riders." Thematic Images for the Neo-pagan "Hecate of the Crossroads"
The near the end of the musical essay, “Hekate, The Triple Goddess," the GS discussed her role as “The Goddess of the Crossroads” and “The Three Roads” in ancient Greece and Rome and her celebration near the dark/new moon at the end of the month. However, instead of the thematic tunes he had been playing (straight up Neo-pagan songs in the genre of New-age Folk and Gothic Rock) for the Neo-pagan dark, chthonic goddess of Night, the Moon, Nocturnal Magic and Witchcraft — the spellbinding dark goddess of “magic potent herbs,” who could bestow vision and creative inspiration in her “pagan grove sanctuaries” —, the GS came to a crossroads in the program and ventured into a divergent genre. Into a witch’s magical cauldron was added a foreign element to the GS’s eclectic mix of musical brew — some R&B. 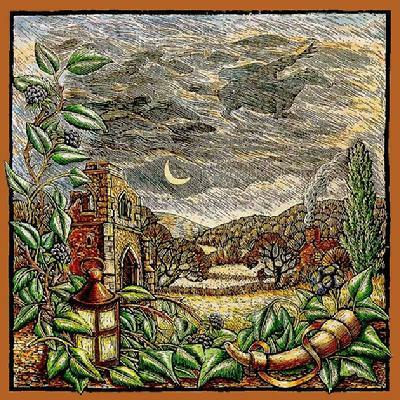 And who would have thought that the same singer-songwriter, who invented the genre of “Celtic Soul” (c. 1980s) with a repertoire ecstatic, romantic (pagan) love songs that sound like they could have come out of W. B. Yeats’ “Celtic Twilight” poems (e.g. “Tir Na Nog”), would put the same transcendent content inside a low-down-dirty R&B song and make it work? But that's what Van Morrison pulled off: the Celtic-Pagan sensibility with a R&B beat! Van’s “pagan heart and pagan soul” took him down to the “crossroads” — Hecate’s Crossroads — where other bluesmen had been before (from Robert Johnson, “Crossroads/Cross Road Blues,” to Eric Clapton, “Crossroads”), but now the archetypal scenery has changed. According to Apollonius Rhodius, Argonautica 4.143, Hekate, “the night-wandering Queen of the world below,” was called on by Medea to enchant by her song. 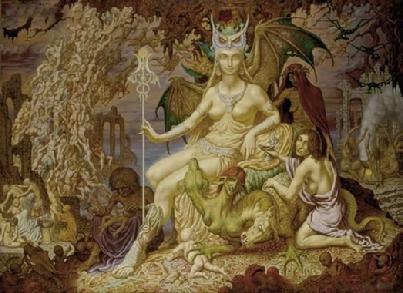 According to Ovid (Metamorphoses 7.74), Hekate Perseis had an “ancient shrine … deep in the forest in a shady grove.” There the witch Medea met Jason, who besought her aid and promised marriage. “Then by the pure rites of Triformis [three-bodied Hecate] and by whatever Power dwelt in that grove he swore, and by her father’s father [Helios the sun] who sees all the world, and by his triumphs and his perils passed. Then she was sure; and straight the magic herbs she gave into his hands and taught their use [making him invulnerable to fire]."